The flag from the song. "The Star-Spangled Banner" is the official national anthem of the United States. 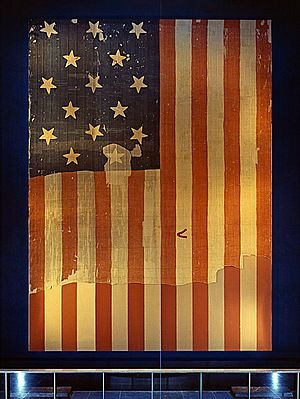 Francis Scott Key wrote the words to it in 1814 after seeing British ships attacking Fort McHenry in Baltimore, Maryland during the War of 1812. The words are set to the music of a British drinking song called "To Anacreon in Heaven". The song has 4 stanzas but only the first one is usually sung. The Star-Spangled Banner Facts for Kids. Kiddle Encyclopedia.